It's been three weeks now since I re-entered the living hell that is a newborn. Except this time it's not hellish at all, it's actually quite pleasant. Toby is still a good sleeper and a calm baby, not bothered at all by his big sister's constant hugs and kisses. Of course I still have to get up several times a night to feed him, but he feeds, burps and then goes back to sleep unlike Anna who would scream for hours on end, day and night. I know he's only three weeks old and all this could change for the worse in a moment, but for now it's lovely and I've even made it back into my sewing room for a little bit of sewing which has made me feel normal again. The directions with the foot do say to use it on thin fabrics, so I made a skirt from a thin knit fabric I had in the stash. Either my fabric was too thick or I wasn't using it properly, but the foot hardly gathered the fabric at all, in fact it didn't gather any more than using a normal presser foot with a really long stitch. Then I tried using my overlocker to gather the fabric by changing the stitch length and differential feed according to the manual and even that gave me the same unimpressive results. 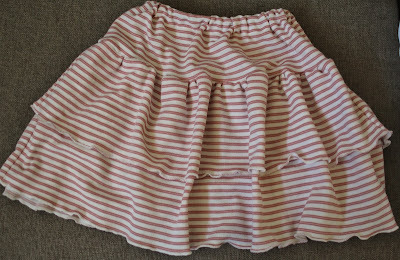 I guess I need to practice more since little girls have a natural love for ruffles! So I ended up increasing the gathers to the required amount in the old fashioned method by pulling up the thread. 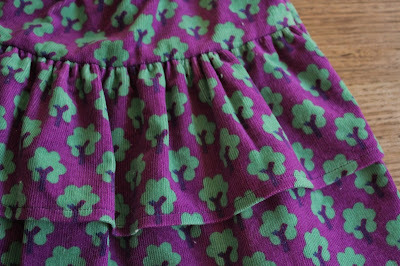 I also used the overlocker to do a lettuce edge finish to the layers to give it a bit more flippiness. Anna loves the finished product anyway, so I call that a success. So now to start sewing something for the boy - he could use some clothes that are a little less pink! The skirts are wonderful. The shoes really do make the outfits. So cute! Agreed. 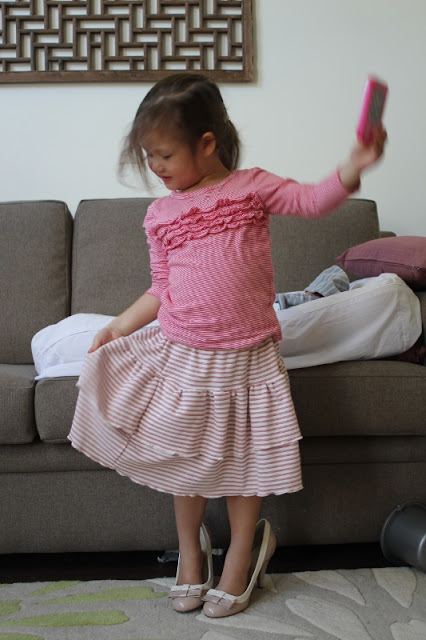 And if you violently disagree with her styling choices, just be sure to announce loudly and often how proud you are of Anna for getting dressed ALL BY HERSELF. There's a higher being somewhere that knows if one baby is hell, the next is an angel and vice versa. Lucky you to get a good sleeper! I think the second baby is often easier than the first because you have better instincts about what to do, when to do it, and realize that however bad it seems, one day soon he will sleep through the night. The skirts are so cute. I'm glad all is well for you. Take care. I use the 'cheating' way at I t works really well. I've been ruffling everything this spring! Ha ha! Anna is so stinkin' cute! So glad the new baby is easy going thus far. Anna is just adorable. She already has her eyes on Mummy's heels. Nice to see you getting up and sewing again! As far as babies, my first also had colic - I still shudder at the memory. When #2 didn't, and acutally slept, it was a blessing beyond words. Most ruffler foots have an adjustment so you can change how often they gather (though I've never used one on knits before). If you gather more frequently (say, every stitch, it will be more ruffly than if you gather every 6 or 12 stitches). Also, you should be able to adjust the knob on it to change the depth of the gather, which will affect how ruffly it looks also. 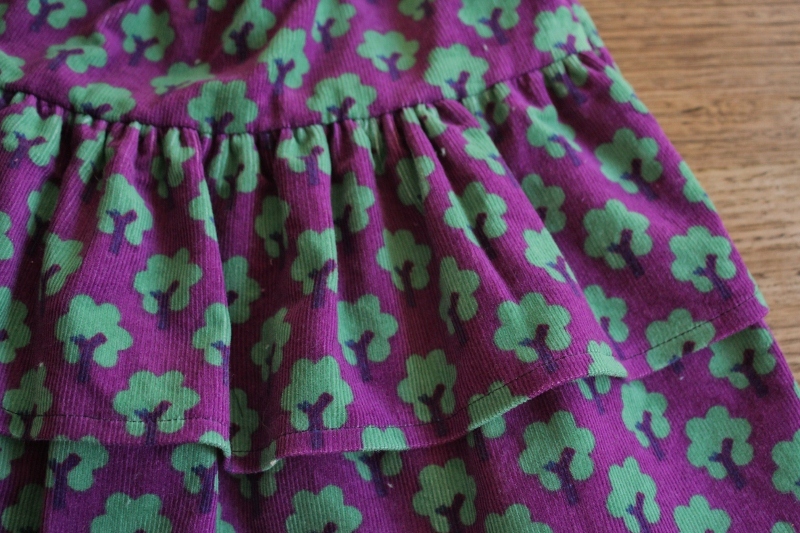 As far as gathering with an overlocker--I don't change any settings, except the outermost needle tension--I crank that up to the highest tension and it ruffles pretty good. 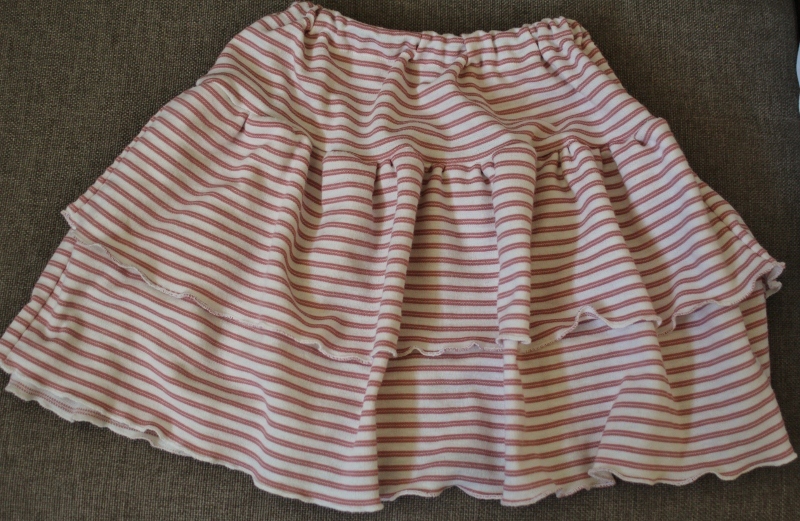 You can run the fabric through a second time for even more ruffles. Try your ruffler on lightweight cotton wovens, I love to use it. 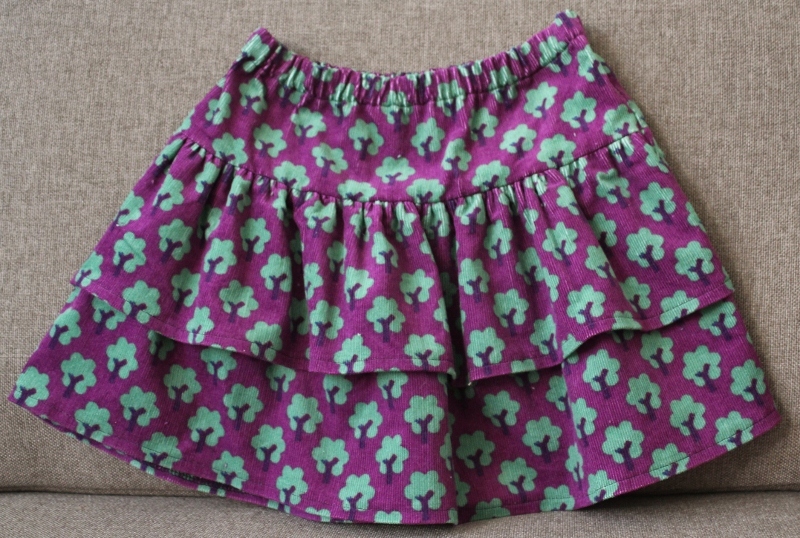 You can ruffle one layer and sew it to a flat layer at the same time. If your overlocker (serger to me) has differential feed, crank it all the way up to facilitate ruffling. And the high tension on the needle is good, too. 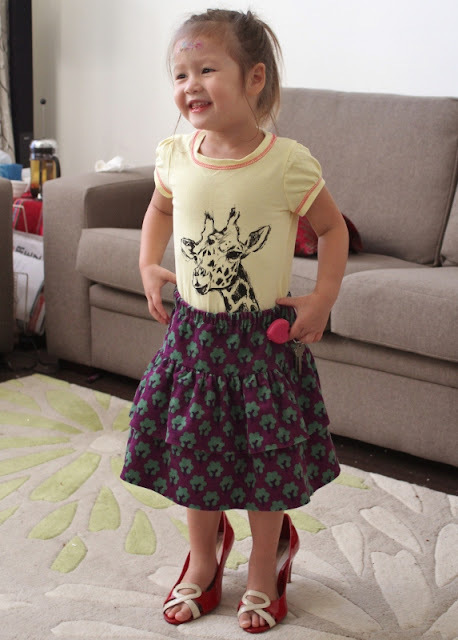 Man, she's the cutest three-year old I've seen, with a killer fashion sense! 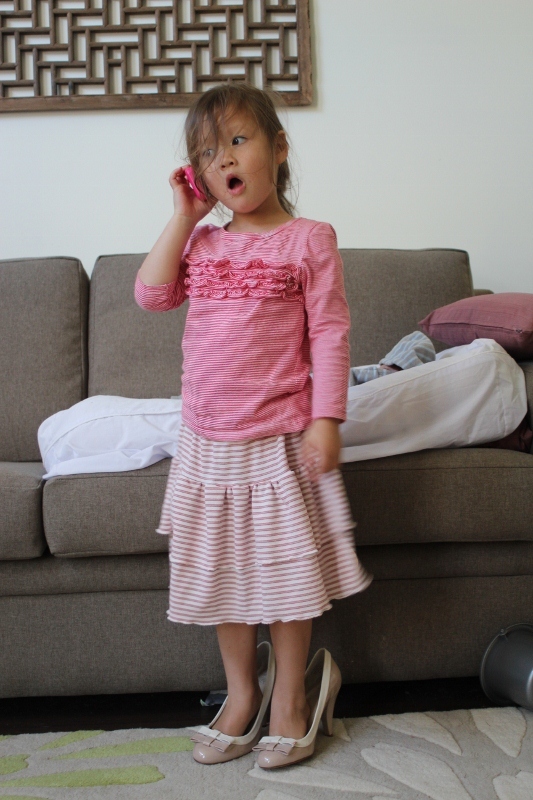 Love the mock-surprise face she has in the picture with the phone. Also - the knit fabric might have been why the ruffle-foot didn't work that well. But I'm no ruffle expert, so that's just a hunch. Oh my goodness, I just love her choice of shoes! I've never had great luck with the gathering foot, either. Cute skirts so perfect with heels! and I'm impressed that you're sewing again so soon after giving birth!! Anna is so cute. Reminds me of my Sofie about 15 years ago. Now she is on the couch with me watching the Block - both keeping warm in our polar fleece dressing gowns and surfing the internet - me the laptop and Sof with her iPad! Daughters are fun. Cute, cute... and your model... well... I hope she doesn't charge the going rate! LoL... Although, she would be worth every penny! Slap some nail polish on those twinkle toes and she's ready to go! Bet she loves having mommy home again! Glad to hear little guy isn't giving you fits... hopefully he won't! Yeah, I think you have discovered the joys of parenting a second child. I suspect part of it is that you know what you're doing so you're more relaxed and more relaxed mummy makes more relaxed baby....That's my unproven theory. The other thing about a second child is that it isn't just you and the baby sitting there staring at each other going "WHAT THE HELL DO WE DO?". There is another child with a routine and the baby just kind of hops on board the moving train. Very impressed you are back sewing though. Cutiest thing I've seen all day!